Who doesn’t love a good juicy burger, salty fries and creamy cold milkshake? Or a tasty hot dog and extravagant ice cream sundae, perhaps? These delicious and comforting foods are even better enjoyed in the atmosphere of a real American-style diner, and you don’t have to travel across the world to experience the quintessential bar stools, neon signs and juke boxes. American diners are alive and kicking in London for us all to enjoy, and here are 10 of the best. This small chain of American diners can be found in various London locations, such as Islington, Shoreditch, Soho, Camden, Dalston, and Kensal Rise, decked out with all-American style red booths and bar stools. The food screams of The States – bacon and eggs sit on the breakfast menu alongside pancakes and waffles, and huge portions of fries and milkshakes accompany burgers topped with cheese, bacon, chilli and a variety of condiments. A great place to meet friends after work or at the weekend for simple, satisfying food and a fun atmosphere. 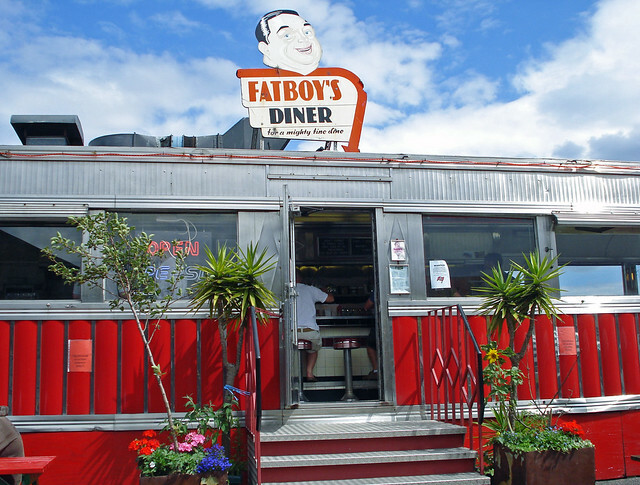 You may recognise the 40s-themed Fatboy’s Diner in Orchard Place, as it has been used as the setting for various Vogue photoshoots as well as the film Sliding Doors. From chilli dogs and apple pies, to coke floats and extra thick shakes, the menu may not do much for your waistline, but will do an awful lot for your happiness. If you’re looking for an American dining experience but want to watch what you eat too, this is the place to try. In line with his well-known healthy eating views, Jamie wanted a diner that focused on fresh, local and sustainable ingredients. With a coleslaw side that counts as one of your 5 a day, you can finally enjoy that burger guilt-free! For a meal reminiscent of the deep South, head to this Covent Garden gem. Alongside the crowd-pleasing burgers, you will find plenty of chicken, cornbread, soft shell crab and more Southern specialities to mix up your American dining experience. For all your cocktail needs, there’s also a bar in the basement of the old converted warehouse where the restaurant is situated. This is an American-style diner with a twist. If you’re looking for more than just a meal out, then All Star Lanes is the place for you, and with branches in Brick Lane, Holborn and Bayswater you will find a location to suit. All Star Lanes offers both bowling and karaoke on top of fabulous food and cocktails, so you are guaranteed to have an entertaining, if not somewhat different, evening here. Boasting fun, nostalgic décor, Ed’s Easy Diner brings 1950s American culture to numerous London locations. Serving traditional diner food and playing legendary music, including Elvis, Ed’s Diner attracts celebrity guests, along with film and TV crews! Key to American cuisine and now making big waves in London is Barbeque food. Boasting 4 different ‘Bar.B.Q’ methods, you’re in the hands of experts at the Big Easy when it comes to wood-smoked meats. The menu is huge enough to cater to all your American cravings, and with a different special running most days you can go every night and have something different; shrimp, steak, lobster, fajitas, you won’t run out of options. The Tinseltown Diner offers its diners a choice of 50 flavours of milkshakes, 60 different burgers, and an extensive menu besides. All products of the diner are Halal, including the 100% Halal brunch menu. The decor is funky and fun, featuring green leather booths around round tables, and coloured lights. The stand-out item on the menu at the Roadhouse involves 2 8oz sirloin steaks, 2 double chicken breasts, mushrooms, cheese, bacon, onions, sauce, served with fries, onion rings and salad. Now, that’s a challenge! Other than the food, this diner has a huge bar scene. In fact, the Roadhouse in Covent Garden is the original flair bar/club, so order a few cocktails and marvel at the talented bartenders and their fantastic display. Open until 3am, you can have dinner, drinks and then party into the night all in this one location. Located on Portobello Road, Electric Diner serves up a French-American menu in a relaxed and friendly atmosphere; think cheese fondue, followed by a hot dog, finished up with a knickerbocker glory, all served by a smiling waitress as and when it’s ready. Follow your meal with a trip to the luxurious Electric Cinema next door, where you can settle down in a leather armchair to let your food settle and take in a good film. Sophie likes to mix up her dining experiences, and will enjoy juicy burgers & cocktails at Meat Liquor, or Lebanese mezze at Yalla Yalla, as much as a fine-dining dinner at The Ritz! With good food, good service, and good company, you can’t have a bad time. Thanks for the post – will try some of these out! Don't go to Ed's Diner! Nice music and style, but the food was horrible! I had fat dripping out of my finished product-tasting burger. No good sauce. Average fries. Saw how the staff filled up Heinz ketchup bottles with cheap ketchup. Way too expensive for that! Not again! An American fruit pie is an essential item on a diner menu and I didn't see one. Pecan pie does not count. Hi, I came back from New York about 4 months ago and when I ate out for breakfast each morning in one of the local cafes near to my hotel, the breakfasts were amazing. I always had French Toast with scrambled eggs with maple syrup and coffee. Can you please tell me if there are any American cafes/restaurants here in London that do those kind of breakfasts ? I would love to have it again. I plan to visit New York again in about 5 years time and will really look forward to having them there again.